Ask fellow campers about "Quail Crossing RV Park" and nearby attractions. The Good, Bad and the ugly... The Good: The owner, mgr who checked us in was wonderful. Nice as could be and very helpful. The park served our purpose. Full hook up 50 amp. The Bad: We were in site 75 on the gravel road. Cars and trucks on the noisey gravel road less than 10 feet from our bedroom window. Awakened numerous times. The gravel was actually rocks that one could break an ankle on. No picnic table, no patio, couldn't sit out. Grass/weeds needed mowing. The road in (AND Out) had tank traps in it. Located in the boonies. Cannot reccommend this park to anyone. Would never stay again. It is for long term people that don't expect much. The best part other than the front office lady was we had a roadrunner that lived in the bush next to us. It was fun to watch the bird and his quirky habits. We camped at Quail Crossing RV Park in a Motorhome. Check-in process was easy. Lady at desk was friendly and inquired about our visit to Waco and after I said we were going to see Chip and JoAnna Gaine's Silos, she provided maps of Waco, driving directions into Waco, suggestions on places to visit and other helpful information. I really appreciated the information she provided as it was very helpful. We were given Site 77, a pull through which was a level gravel site. Sites were spacious with grass around site and trees on most sites. Campground appeared to have a lot of long stay RVs but it was neat and clean. Rate for one night was $35.00 with Good Sam discount + tax. Cable TV available for long term with Fee & equipment through the office. Good reception on my Antenna with lots of stations. WiFi available for most sites but it did not work at my location. Did not use the bathrooms or the laundry. Note: Don't use GPS to get to the site, use the directions shown on Quail Crossing RV Park website. We camped at Quail Crossing RV Park in a Fifth Wheel. Note: Don't use GPS to get to the site, use the directions shown on Quail Crossing RV Park website. This is a great location only 6 miles out of Waco. It is intended for people who are self contained and has long pull thru sites. It gets low scores because of small bathrooms (the reason for self contained) and only 3 washers and dryers. The people are friendly and knowledgeable about the City of Waco. We have a 42' motorhome and, due to doctors appointments, are staying two months. Rate is based on a monthly. Rates are $200 week, $350 month + electric. Daily varies. Great place, quiet and well kept. We camped at Quail Crossing RV Park in a Motorhome. Waco has lots to do such as Texas Rangers Museum and Dr. Pepper Museum. Within 20 miles are lots of things to see and do. Of course there is the Silos and Magnolia Table. We had to use this RV lot for 3 nights. So disappointed that we were misled by Good Sam review. We pulled in late in evening & was very surprised that it site ares in what looks like old cow pasture. If you are not expecting much then this is it. A lot of RV trailer living people that were questionable. We looked to move for next day but other RV campgrounds already booked full. Very bad for our vacation to have to stay in a place like this. Gravel pads, somewhat level, no cable (can buy Wifi adapter in office). We used our antenna for just a few channels. Way out from anywhere, mosquitoes, & large croaking bullfrogs at night. Could not sit outside. No picnic table @ site for cooking. No grills. Terrible. We think out cost was between $35-40.00. Didn't even get our Good Sam discount. We camped at Quail Crossing RV Park in a Motorhome. We stayed for two days using Passport America and would have stayed longer if they allowed more days. Overall, this is a no frills park; mostly full time residents in RVs and cabins. They have pull-through sites, and the water (no need for water filter) and electric are good (we check the electric every time). The sites were pretty level and I did not have to put any levelers under the tires. They have both 30 amp and 50 amp and can handle large RVs. They did have WiFi, no cable, but plenty of antenna stations. There is no pool or club house, but the restrooms and laundry room were clean. Sites are gravel with a little grass next to your site; no picnic table. There is no dog walk area per se, but there is a path going to the back behind the fishing pond where they grow pecan trees that I was able to let the dogs loose and run around. One thing I look for at a campground is a place to let my dogs run loose. Some campgrounds do have dog parks, but most are so small they are practically worthless, so I always look for an area where no one goes to let them loose. We camped at Quail Crossing RV Park in a Travel Trailer. This park is about 20 minutes from Waco where we went to see the Texas Ranger Museum, the Waco Mammoth National Monument, and the Suspension Bridge (part of Chisolm Trail). There is so much more to see in Waco, but we just had 1 day. Will have to go back. Stayed the night while it was storming. RAIN. Did not see much of the park except driving in, hooking up, walking (more like dragging because of thunder) the dog, unhooking and pulling out. It was quiet, except the lightning and thunder. Site was tight and wet. Some trees. Hook ups were easy to find and good. Did not set up satellite do to fear of being cooked by lightening while doing that job, so I used the available cable. Had Fox news so we were happy. We camped at Quail Crossing RV Park in a Fifth Wheel. Wanted to go to Magnolia Store, from the show "Fixer Upper" on HGTV but stayed only 1 night because of the storm. Did stop in Waco and found plenty of parking for our rig and did see it. long gravel pull thru, mostly level, good hookups. wi-fi was good. some shade, quiet park, sites close together. mostly full timers. Cable available for 3.00 a day and you have to sent up a box,,, couldn't get it to work at my site. Linda in the office was very helpful, some OTA channels. Not many amenities just a no-frills park good for a nightly stay. We camped at Quail Crossing RV Park in a Travel Trailer. Park was hard to find and way off the beaten path. Most residents in the park look like they are permanent. Sites were gravel and unlevel. Pretty shoddy at the best. Only nice thing about the park was the manager. Probably wouldn't stay here again. We camped at Quail Crossing RV Park in a Motorhome. We were very disappointed in the rv park. Most of the people staying at the park were living there full time. It was hard to find. The facilities and buildings were old. The sites were not level and not concrete. The pool was an above ground pool and was not maintained. We camped at Quail Crossing RV Park in a Fifth Wheel. No shade available. No meeting room or activities. Pool was not available for use due to the cold weather. Gravel sites with good grass and table. Washers/Dryers in unheated building with door open. Would stay again, but not for long. We camped at Quail Crossing RV Park in a Fifth Wheel. We stayed here in August and the temperature hovered around the 100 degree mark all month. One week it was over 100 degrees every day. There is very little shade here so our air conditioner ran 24/7, and it was till over 80 degrees in our rig. The park owners were very friendly and they put us along the fence where we had the most chance of shade in the late afternoon. They have added about six new sites along the fence line at the rear of the park and these are the ones to get if you want any shade. The other shady sites are already used by permanent residents. While we were there, the owners were putting the finishing touches on a new pond. Not sure if they are going to stock it with fish or if it's just for looks. They have also added a new above ground pool that looked very inviting after a blistering hot day, however, by the time I got home from work, I was too tired to use it. Beware of fire ants. While my husband was outside rearranging our sewer hookups he didn't notice he was standing on an ant hill (the tall grass had hidden it) and by the time he felt the first sting his feet were covered in ants. He suffered 42 ant bites and his feet were swollen for several days. Other from that our stay was nice enough. The monthly rate was $275 plus metered electric. When I left, our electric bill was $207 from running the air conditioner but the heat would have been unbearable without it. We camped at Quail Crossing RV Park in a Motorhome. 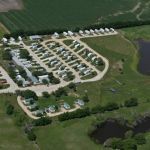 PROS> Extremely friendly and helpful staff, level sites, free cable TV, free Wi-Fi, laundry, small camp store, small golf driving range, plenty of room for pets, and located in a quiet, rural setting adjacent to a nice pond in which fishing is permitted. CONS> The facilities here are very old and are in dire need of a regular maintenance schedule. This park is well off the beaten path and is a bit hard to find (our GPS didn't recognize the address and the staff talked us in via our cell phone). There are many permanent residents here, most of whom work locally and none of whom occupy RV's that have been recently washed, waxed, painted or cleaned. OVERALL> This is a quaint little park and is very well suited as a home base for exploring Waco and surrounding areas (which is what we did). If you're looking for luxury or status, however, this place won't fit the bill. Our $22.50 rate (RVParkreviews won't let you enter cents) was calculated after applying a Good Sam discount. We camped at Quail Crossing RV Park in a Motorhome. Are you affiliated with Quail Crossing RV Park ?